The project involved designing, building and installing 2 online electrical test stations and 1 offline rework station for IAC’s new cockpit manufacturing facility at Halewood, Liverpool. IAC required the solution to be fully integrated with other plant-wide systems and fixtures. The installed systems had to be robust and reliable to allow for 24/7 operation testing 45 cockpits per hour. Collection and storage of detailed test result information was also part of the brief. 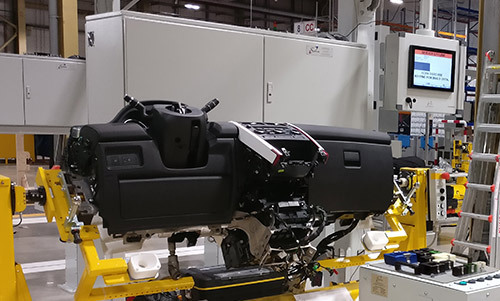 IAC Halewood features an extremely flexible cockpit just-in-time (JIT) assembly line for several vehicle models, substituting a fixed carousel with 42 Automated Guided Vehicles (AGVs). 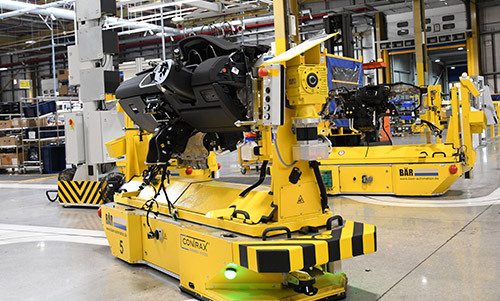 The AGVs enable mass customisation and can assemble up to 4 million variants on one production line that can be easily reconfigured by re-taping magnetic guidance stripes on the shop floor. 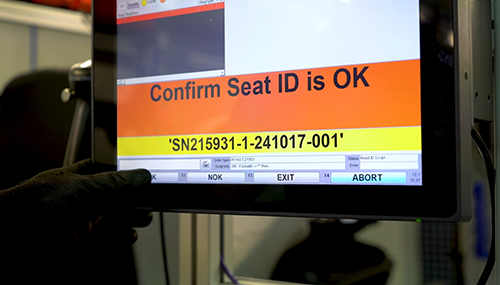 The primary requirement for the electrical test stations is to test the cockpits for connectivity and part number traceability in order to detect any connections which have been missed during the assembly process. 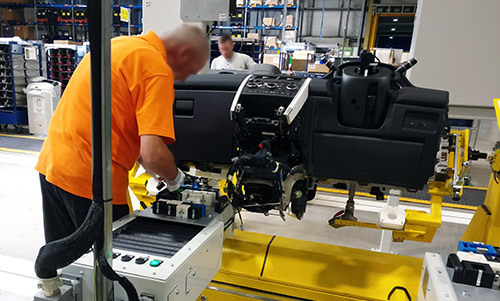 After a thorough requirements capture exercise Sorion designed a system based on their established electrical test technologies, with proven reliability in hundreds of installations within the automotive industry around the world. 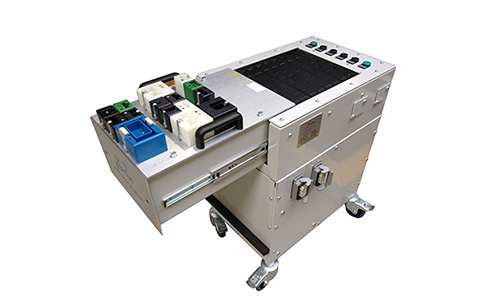 The equipment was designed to allow maintenance, upgrade and modifications to be easily obtainable and comes with excellent support packages. 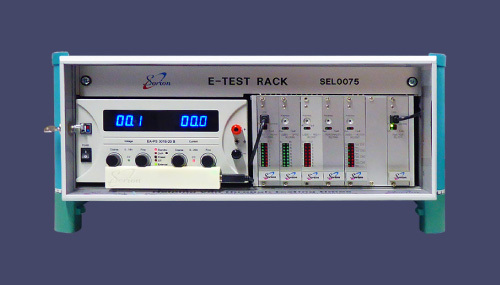 The test process is managed by Sorion’s core runtime software, Sextans-RT, utilising configuration data and custom scripting centrally managed from an IAC server. The operator is guided through the process via plain text and pictures. The cockpit to be tested arrives to the station on an AGV and stops in a defined test position based on model and left/right hand variant. Fully intergrated with the AGV contolling PLC, the test station gathers build data from the PLC system to identify the cockpit and load the individual tests appropriate to that model/variant. The station illuminates the LED indicators on the connector blocks that need to be connected. Once all connections are in place the operator activates the main sequence to test for the correct connectivity of individual components by simple electrical connectivity tests or via CAN or LIN communications as appropriate. Where available, the system records part numbers, serial numbers and firmware revision. This also adds extra traceability to the manufacturing and test process. results and system performance reports via a web browser. International Automotive Components (IAC) is a global supplier of automotive interiors (instrument panels, cockpits, door panels, center consoles and more). 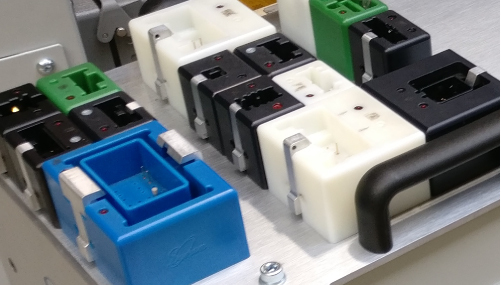 Design, manufacture and installation of end of line electrical test stations for a new cockpit assembly line. If you would like a quote for your electrical test project, please give as much information as you can and we will get back to you. Complete the contact form or call our team on 0121 454 8966.